Pumpkins symbolize the fall season. We celebrate with pumpkin lattes, pumpkin bread and pumpkin pie but you haven’t tasted fall until you’ve dipped your spoon into this creamy pumpkin soup! It starts off with fresh roasted pumpkin. You may have one sitting on your doorstep, or decoratively placed on you kitchen counter. I recommend using Sugar Pie Pumpkins or any other small darker fleshed varieties. The smaller the pumpkin the sweeter the taste, they are also easier to slice and bake. I used a food processor to puree the baked pumpkin. You can skip this step and manually mash because you will be blending the soup once all of the ingredients are combined. I prefer a smoother consistency and the process made it much easier to later mix and blend. My hungry taste testers were pleased with the bits of buttery onions that didn’t blend in completely. They called them little surprises. so don’t worry if your hand blender doesn’t get every little bit! This soup will make you smile, sink your taste buds into the season and make you feel warm and cozy inside! 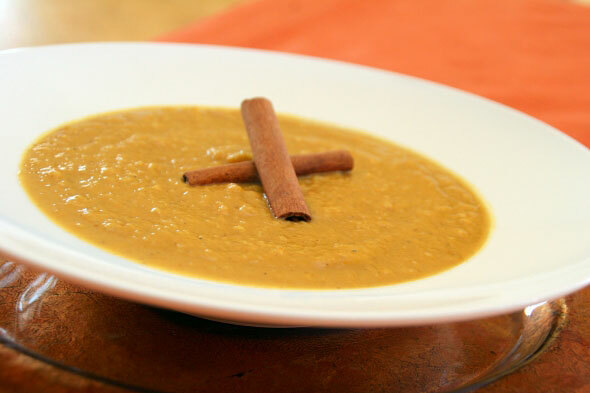 You haven’t had the true experience of fall until you’ve dipped your spoon into this creamy pumpkin soup! Don’t skip out on roasting the fresh pumpkin; it’s the only way to taste the real flavor! Melt butter in a large cast iron or other large pot on medium-high heat. Add onions and a pinch of salt; sauté until very tender, about 7-10 minutes. Add garlic and sauté 1 minute longer. Add nutmeg and cinnamon and sauté until incorporated. Add chicken broth, milk, heavy whipping cream, mashed pumpkin and stir. Partially cover and bring to a light boil. Remove from heat and puree mixture with hand blender until smooth. Bring soup back to a low simmer. Stir in brown sugar, salt and pepper. Soup should be slightly thick, add additional chicken broth and simmer for a thinner consistency if preferred. *To bake pumpkins, remove tops and scoop out seeds and stringy pulp. Slice pumpkins into quarters and place on a large foiled baking sheet. Bake in the center of the oven at 400 degrees for 45 minutes to 1 hour, until very tender. Cool, scoop out flesh and mash. For a smoother consistency, puree in a food processor. *Sugar Pie Pumpkins recommended for a sweeter flavor.